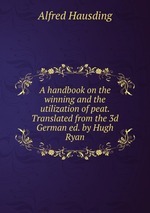 Аннотация к книге "A handbook on the winning and the utilization of peat. Translated from the 3d German ed. by Hugh Ryan"